On his way to Paris Sunday morning, Netanyahu called for a renewed fight against terrorism and for Jews to come home to Israel. 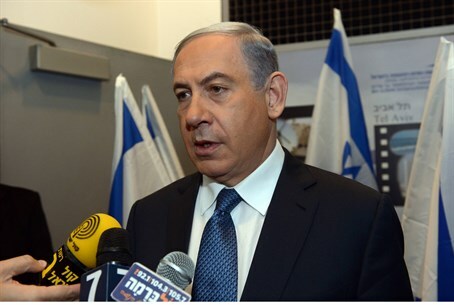 Prime Minister Binyamin Netanyahu left early Sunday morning for a two-day visit to France following the multiple terrorist attacks there last week, which saw 17 people murdered, including four at a Jewish supermarket. Later on Sunday, Netanyahu, as well as many other world leaders, will attend a mass national rally in Paris to pay tribute to the victims. The rally is expected to draw more than a million people. Initially, the Prime Minister announced he would not attend the rally, citing security concerns. However, he subsequently changed his mind. Netanyahu was accompanied by Foreign Minister Avigdor Lieberman. MK Eli Yishai and Economy Minister Naftali Bennett, who also plan to attend, flew out earlier. At the entrance to the plane, Netanyahu told media: "I am off to Paris to attend the rally with world leaders in a renewed fight against the Islamic terror that threatens all of humanity. I have been calling for this for years." "Additionally, this evening I will attend a special rally with the President of France and the Jewish community. I will tell them that every Jew who wants to immigrate to Israel will be received with open arms." On Saturday, Netanyahu led similar calls in Israel for French Jews to "come home to Israel" in the wake of the terrorist attacks. "To all the Jews of France, all the Jews of Europe, I would like to say that Israel is not just the place in whose direction you pray, the state of Israel is your home," he said in a televised statement, referring to the Jewish practice of facing Jerusalem during prayer. "Unless the world comes to its senses, terror will continue to strike in other places," he added in remarks on his official Twitter account.